Our knowledge of Wallace genealogy begins with Andrew and Eleanor Campbell Wallace, Lew Wallace’s grandparents on his father’s side. It traces the eight Wallace children, their children, and their grandchildren with birth and death dates (if known). Many of our visitors believe they are related to Lew Wallace. 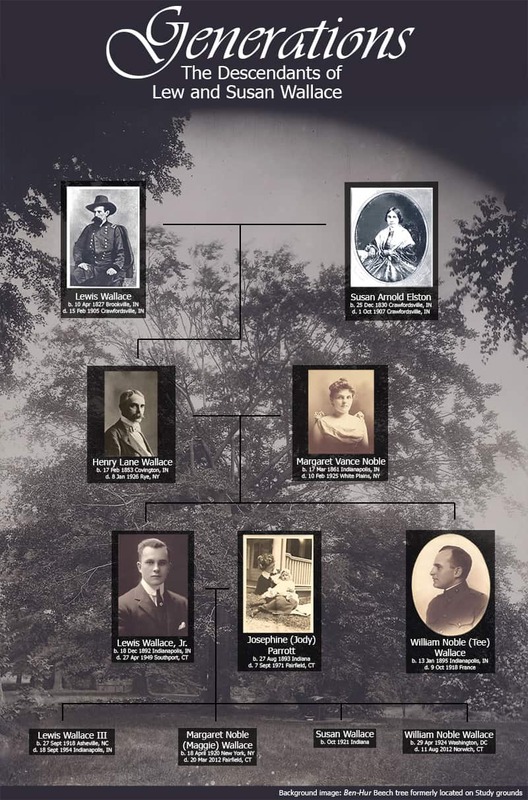 The number of descendants of Lew and Susan Wallace is relatively small; they only had one child. However, Lew’s brother, William, married into the prominent Butler family of Indianapolis and had a large family. If you believe you are a Wallace descendant, we suggest you begin your research with William Wallace, Lew’s brother. Please Note: The Wallace genealogy file is a working document. We have made every effort to ensure this information is correct, but we are constantly researching and receiving updates. Andrew Wallace (1778-1826) married Eleanor Campbell (1778-1849). Their children were: 1. David, 2. Catherine, 3. Benjamin Franklin, 4. John Thompson, 5. William Henson, 6. Thomas Jefferson, 7. Washington, and 8. John Milton. David Wallace was born April 24, 1799, in Mifflin County, Pennsylvania. He married Esther French Test (1806-1834) in 1834. They had four children: William (1825-1891), Lew (1827-1905), John (1829-1832), and Edward (1831-1886). Two years after Esther’s death, David married Zerelda Gray Sanders (1817-1901). Zerelda and David had six children: Mary (1837-1871), Ellen (born 1845, died young), Agnes (1849-1928), David Jr. (1852-1911), Jemima (born 1854, died young), and Sanders (born 1857, died young). William married Cordelia Butler (1828-1866) and they had six children: Esther, Zerelda, Lew, Ovid, Anna, and William. After Cordelia’s death, William married Sarah Maria Jameson. They had two children: David and Helen. Lew and Susan were married in May 1852 and set up home in Covington, Indiana, where Lew practiced law. After the birth of their only child, Henry, on February 17, 1853, the family moved to Crawfordsville to be closer to Susan’s family. While Lew pursued his career as a lawyer and author, Susan became his biggest supporter, kept the house, raised their son, and found the time to be an accomplished author as well. Henry attended Wabash College and graduated with honors in 1874. He worked at a bank for two years before opening several stave factories. Henry married Margaret Vance Noble on June 15, 1882, while his parents were in Turkey. The couple had two children, Lewis Jr. (born December 18, 1892) and William Noble “Tee” (born January 13, 1895). Our 2013 exhibit Generations explored the accomplishments of many of Lew and Susan’s descendants. The text of that exhibit is available in booklet form from our gift shop.